This savory cheesecake with bacon is so delicious with it’s rich and buttery crust. It also happens to be gluten-free and not too tough to make. 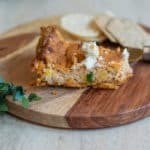 Any crackers will do for this recipe but I love the robust flavor of the Crunchmaster herb crackers. I really like that they are also gluten-free.